EFFECT: Three coins have just passed through the table, one at a time. Every viewing eye is unblinking as they wait for the fourth coin to pass through. The left hand takes the first three coins underneath the table as the right hand attempts to push the fourth coin through. 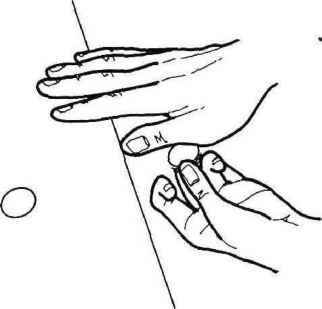 The coin is seen at the center of the table as the right hand lifts into the air and slaps down on the coin. Much to the surprise of everyone, the fourth coin has not penetrated. Instead, the other three coins have passed back up through the table to rejoin the visible coin! COMMENTS: The coins through the table is one of the all-time great classics of close-up magic. ]fs a wonderfully simple, straight forward concept. Yet, for some reason, I never bothered to learn it. However, when Mike Gallo showed me this beautiful ending it turned out to be all the motivation I needed. I love ending routines with a logical "kick" to them. The important word there is logical. Many magicians have routines with kicks to them that have nothing to do with the basic effect. They might as well say, "There, that's the last coin through the table, and not only that, but the deck changescolor! "Huh? Mike Gallo is not just an idea man. He understands good magic and works hard to find good ideas as well as the best possible method to accomplish them. I believe Tony Slydini used his Imp Pass to accomplish the same type of effect in his coins through the table routine using six coins. Needless to say, Slydini stands alone in his ability to convincingly deliver the material he conceives. However, this handling of Mike's better fits the average magician's coins through table format, and employs a new handling which is effective yet within the reach of any student of sleight-of-hand. PROCEDURES: So many methods are printed for passing the first three coins through, that I will not clutter this explanation by repeating them. What you will essentially do is an Imp Pass directly into the classic palm in the right hand. I structure my routine so that the right hand apparently has two coins above the table and two coins are below. The actual situation is that the right hand has only one coin, and three coins are now below the table. The right hand slaps the coin(s) to the table and the third coin is heard to travel. The right hand remains flat on the table and does not reveal the fact that only one coin remains. 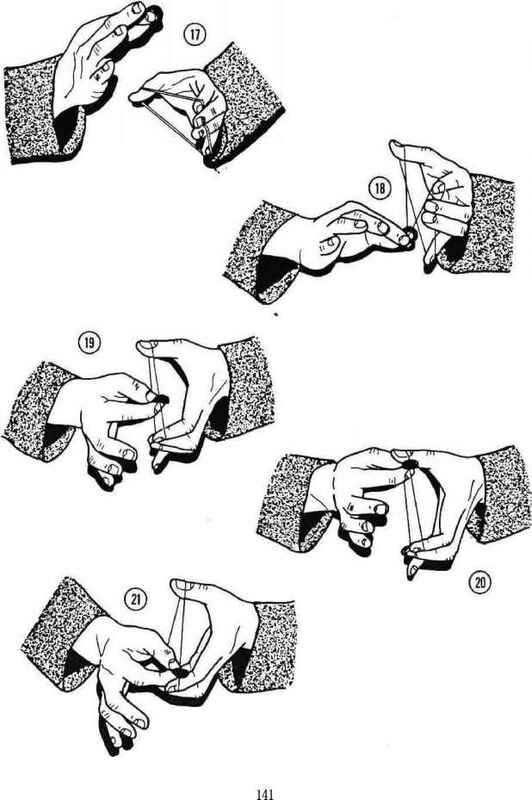 The left hand comes back to the top and dumps its three coins to the table. The left hand picks the coins up one at a time into a stack and returns under the table. Some suspicion should be in the spectator's mind as to what is really underneath the right hand. In their mind there could still be two coins or there might evenbe no coins. For this reason there will be powerful misdirection when you move the right hand to show what is underneath. "For the last coin 1justpush. Wait. You don't trust me! See the coin is still there." 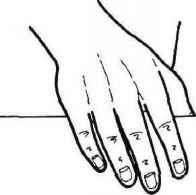 As you say this, the right hand moves directly backwards so only the pur fingers are resting on the table. FIGS. 1, 2, and 3 show the left hand as it actually places the three coins in a stack directly in to the righthandclassicpalm as it pauses for an instant at the edge of the table.